Last February, U.S. President Barack Obama announced he was sending military personnel and drones to Niger. The American effort in the West African nation is now rapidly becoming a hub for operations in the entire region. Satellite imagery confirms that there is a base in the vicinity of the country’s capital Niamey. The American site is near Diori Hamani International Airport and the collocated Nigerien Air Force’s Base Aérienne 101. French forces are also be present in Niamey and may use these facilities or another base for their own unmanned aircraft. As of last December, the Pentagon had approximately 200 personnel in Niger. The White House said the objective was to “provide support for intelligence collection and to facilitate intelligence sharing with French forces conducting operations in Mali and with other partners in the region”. American drones are probably flying from Niamey over various locations in the region, including Southern Libya. The drones trying to help locate hundreds of Nigerian schoolgirls kidnapped by the nebulous extremist group Boko Haram are probably operating from Niger as well. While this drone mission takes center stage in most reporting, the Pentagon also appears to see Niger as a new hub for counter-terrorism operations in North and West Africa. In April, the Department of the Navy issued a so-called sources sought notice for contractor air support for AFRICOM based in Niamey. Of course, the U.S. government only uses sources sought notices to glean information from the private sector for planning purposes. These notices don’t mean contracts are forthcoming. 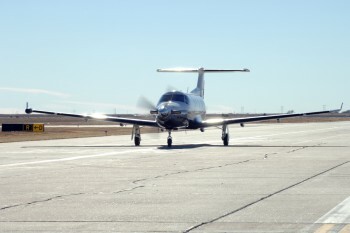 Contractors would likely fly an aircraft like the Pilatus PC-12 seen here on missions from Niamey (Photo: Air Force). However, sources sought notices do give a window into the planning process. In this case, the proposal says the selected contractor would provide at least one fixed wing aircraft and one helicopter and aircrews. The private personnel would be on call for personnel recovery, casualty evacuation, and search and rescue missions. The crews might be called upon to fly anywhere in what the notice calls the “Primary Operating Area”, which is anywhere up to 500 miles (800 km) from their base. The “POA” includes Algeria, Burkina Faso, Chad, Libya, Mali, Morocco, Niger, Nigeria, Cameroon, Cot D’Ivoire, Ghana, Benin, Togo, and Tunisia. The aircraft might also have to go to other locations “as dictated by operational requirements”. While this is interesting on its own, the requirement to be able to conduct operations in Burkina Faso is particularly relevant. The requirements in this sources sought notice are essentially identical to a contract U.S. Transportation Command (USTRANSCOM) put out last year. TRANSCOM’s contract differs mainly in one key area: the aircraft were based at Ouagadougou in Burkina Faso. The new sources sought notice is very likely gathering information as part of a larger plan to relocate these services to Niamey. Since the mid-2000s, Ouagadougou has served as the hub for regional counter-terrorism operations. American special operations forces were based there, along with an aviation detachment and other support provided by contractors. Burkina Faso’s capital was also an intelligence nerve center. Small manned spy planes flew “Creek Sand” missions from the airport and the intelligence was compiled by a fusion called nicknamed “Aztec Archer”. These missions were part of regional effort that started in earnest after the terrorist attacks in the U.S. on Sept. 11th, 2001. The Department of State quickly created the Pan Sahel Initiative (PSI) to work with and coordinate support to and between countries in the region, including Niger. In 2004, the PSI gave way to the Trans-Saharan Counterterrorism Initiative (TSCTI). The TSCTI was renamed again in 2008 as the Trans Sahara Counter Terrorism Partnership (TSCTP). Currently, the TSCTP is a joint effort between State, the Department of Defense (DOD), and the Agency for International Development. 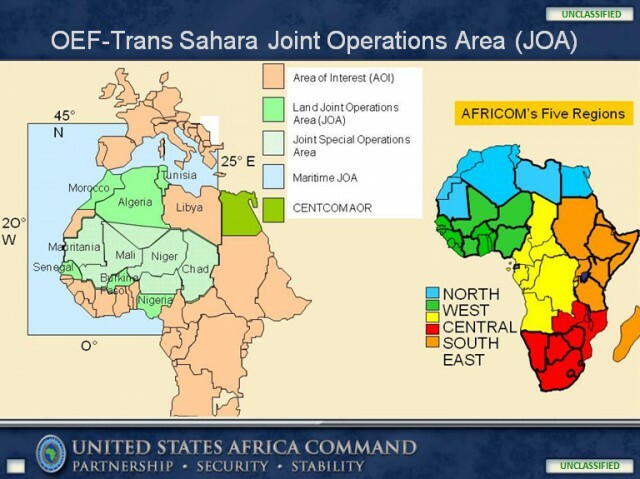 The TSCTP consists of Algeria, Burkina Faso, Chad, Libya, Mali, Mauritania, Morocco, Niger, Nigeria, Senegal, Tunisia, and the U.S.
Operation Enduring Freedom – Trans Sahara (OEF-TS) Joint Operations Area (JOA) map from a 2011 U.S. Africa Command briefing. DOD handles most of the TSCTP military assistance and training missions. In 2005, these activities were grouped together under Operation Enduring Freedom – Trans Sahara (OEF-TS). This name is apparently being replaced by Operation Juniper Shield. At the moment, the two nicknames continue to be used together. A small task force of American commandos leads the individual exercises on the ground. Their name has also recently changed from Joint Special Operations Task Force – Trans Sahara (JSOTF-TS) to Joint Special Operations Task Force – Juniper Shield (JSOTF-JS). U.S. European Command (EUCOM) was in charge of these forces and their mission until the creation of U.S. Africa Command (AFRICOM) in 2008. Washington seems to think Niger is better suited to support operations in the region. The new focus on Niger is a significant change for American policy in addition to a major move for U.S. troops. As recently as 2011, the West African nation was described as one of four core countries in the OEF-TS campaign plan. At the same time, the country ranked second to last – right above Libya – among the TSCTP nations in DOD’s list of engagement priorities for the mission. US government policies apparently limited access and restricted cooperation according to unclassified documents. The Department of State and the U.S. Embassy in Niamey have not responded to requests for clarification at this time. 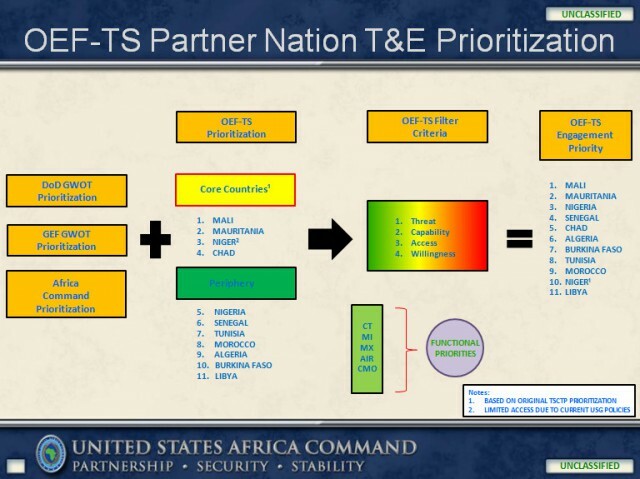 Operation Enduring Freedom – Trans Sahara (OEF-TS) Partner Nation Train & Equip (T&E) Prioritization chart from a 2011 U.S. Africa Command briefing. Reports on American military assistance programs reinforce these claims. 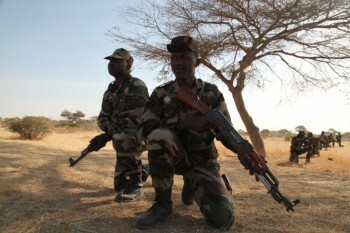 Between fiscal years 2008 and 2011, the U.S. government provided no money what so ever to Niger under Section 1206 of the annual National Defense Authorization Act, which covers aid to foreign militaries. Some money was provided under Section 2249c of the U.S. Code’s Title 10, which is the Combating Terrorism Fellowship Program. These funds sent Nigerien personnel to officer and intelligence training programs at places like the National Defense University in Washington, D.C; the Joint Special Operations University at MacDill Air Force Base in Florida, and the Regional Joint Intelligence Training Facility (RJITF) at RAF Molesworth in the United Kingdom. But in Fiscal Year 2012 something changed (see also here). The intervention in Libya in 2011 and crisis in Mali in 2012 appear to have upended a lot of the OEF-TS campaign plan. Section 1206 monies funded a “Niger Air Logistics and Communications Enhancement” program. The aid package included two Cessna 208 Caravan – a popular type for American aid packages and covert operations – and radios. The aircraft were specifically intended to help supply Nigerien forces along the border with Mali. They could also be used to conduct visual reconnaissance missions. This was followed by the decision to establish the drone operation in Niamey. The U.S. Air Force also appears to be working to expand that effort. Niger also hosted this year’s Exercise Flintlock, an annual counter-terrorism training mission run by U.S. and other special operations forces. If this analysis is correct, Niamey may represent the latest element in a solidifying strategy for AFRICOM. The American missions at Camp Lemonnier in Djibouti and Entebbe International Airport in Uganda also perform this function for operations in East and Central Africa respectively. A Canadian Special Operations Forces CH-146 helicopter helps train Mauritian troops to evacuate casualties during Exercise Flintlock 2014 (Photo: U.S. Africa Command). 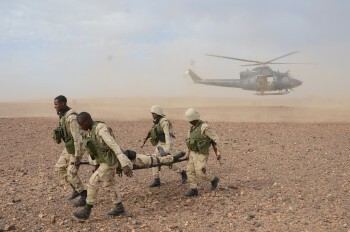 The activities conducted in Djibouti as part of Operations Enduring Freedom – Horn of Africa and Octave Shield mirror those performed under OEF-TS and Juniper Shield in many ways. American efforts out of Entebbe are focused largely on Operation Observant Compass, the American contribution to the fight against the brutal Lord’s Resistance Army (LRA). The Pentagon also recently used the facilities at Entebbe to support non-combatant evacuation operations in South Sudan and peacekeeping efforts in Central African Republic. The Pentagon also does its best to steer clear of using the word base to describe any of these facilities. Terms like “operating site” or “forward operation location” are more commonly used. This helps both the host nation and the U.S. keep operations hidden, but generally due to domestic political considerations rather than anything more nefarious. Notably, AFRICOM Commander US Army General David Rodriguez described Camp Lemonnier in Djibouti as “a major forward operating site” and later corrected a reporter who attempted to use the word “base” during a recent press conference. Reports generally describe the Camp, operated by the Navy, as American’s only avowed base on the continent. There is the possibility that General Rodriguez may have actually been referring to Chabelley Airfield. U.S. drones moved to Chabelley last fall because of safety concerns. The scope of the operation at Niamey may fall in between the efforts in Djibouti and Uganda in the end. Djibouti’s geographical location means American forces there are concerned with the Middle East, as well as Africa. These additional responsibilities account for the size of the American presence there. The hunt for Joseph Kony and the LRA is relatively minor concern compared to terrorism, drug trafficking, and other threats in East Africa and the Sahel region. The Pentagon sometimes boosts the forces at Entebbe, but only for specific missions and only temporarily. The facilities in Niger will no doubt expand to be able to perform more regular missions than DOD conducts out of Entebbe. The Pentagon, however, may not see the need for the kind of large semi-permanent force deployed in Djibouti. However, Niamey will likely become an important hub in the region no matter what size it is. This entry was posted in English, Intelligence, International, Joseph Trevithick, Niger, Nigeria, Security Policy, Terrorism.